While the Matrix feels like underestimated, it can be used for all kinds of Control voltage toolbox set ups. In this article I will show some of the different set ups which I sometimes use in my own productions. So lets get ready for the Matrix Reloaded shall we? 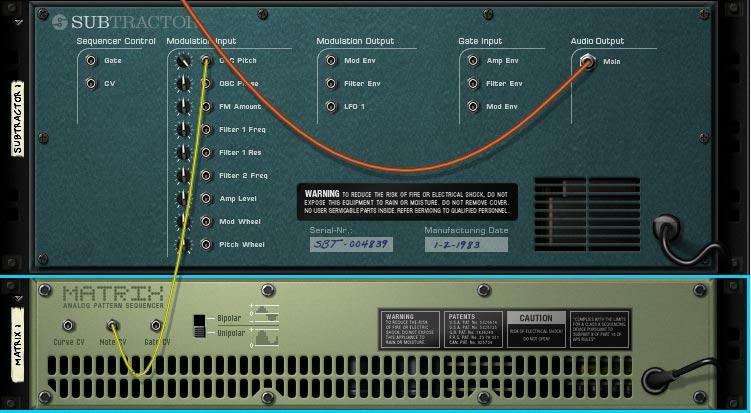 In its default state the Matrix has a default connection where the Gate CV triggers the Gate events (turning the notes on / off), while the Note CV triggers the pitch. Normally we would define the patterns once and we would be on our way. The issue that I sometimes have with a linear setup like this is that it feels stiff. Sometimes there is need for some control on the different note changes and so on. For this issue I have the following solution for you. At this point there are different flavors since it totally depends on where the gate is being connected to. 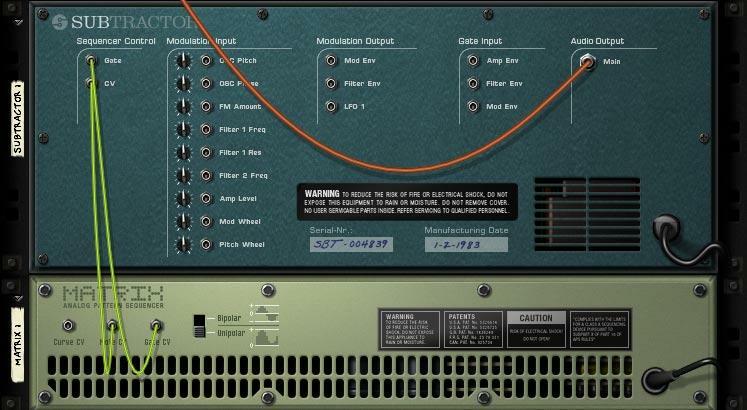 Just to put this thing in to context with the original behavior of the matrix, lets use the connection from Gate CV to Amp. At this point the Gate CV will tell when the note is being played and when it is turned off. There are some notes regarding on how to use this system. While using this set up we can draw in different pitch changes relative to the C note (this is why the CV Modulation amount knob needs to be all the way open). While going to the front of the Rack we can therefor make pitch changes while drawing them in the Matrix. Also note that the Key Octave is set to 0 in this case. And the notes that are being used are C, C one octave up, A and A# in this case. Next we can use the Sequencer to tell when the notes are active. Thus it becomes a combination of two: the sequencer determines the pitch of the notes and when they are played. Second the Matrix will automaticly change the pitch accordingly to the pattern that we created in the Matrix. The reason why this is sometimes handy is that we can define Arpeggiated patterns inside the matrix. While changing the notes using the sequencer or Midi Controller, the Matrix will follow those pitch changes relative to the native note. In this set up you don't have to be Michael Jean Jarre to play perfect sequences. Just let the matrix do that for you. I might also add that since the RPG-8 has been introduced I use this set up less, however sometimes there are moments that the RPG-8 just doesn't feel right. So now you have an alternative to make custom arpeggios. Alternative here is that this set up allows you to focus more on the different automation sequencers rather then focusing on the notes. Since the notes can be long notes while the Matrix will act as a note transpose instead. It is a different take on using the Matrix. It requires a different way of thinking. But from what its worth to add, it has been adding a creative boost in my own productions back in the days. So its worthwhile the effort to use the matrix in these type of set ups. Another approach on using the Matrix is using it as an advanced randomizer. 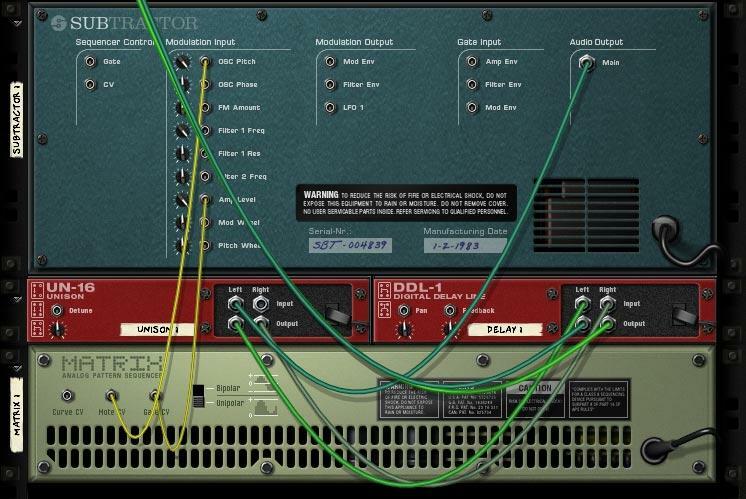 There are some Reason Rack extensions that are based on logical operators like AND and XOR. Believe it or not, the Matrix is capable of handling these logical operators. In a nutshell it requires 2 or more Matrix pattern sequencers to make it work. Logical operators will always use 2 different values to make it happen anyway (eg: 1 AND 2 or 6 XOR 1). Since this isn't a math class but a Reason tutorial, I will skip the math side of things. In this particular set up I am going to use the Malstrom Index setting to make changes to the waveform. As you can see in this picture the CV connection has been made to the Index of the Malstrom. By turning down the Motion of the Index of Oscillator A and B it will allow the CV signal to pick different waveforms which are available in a specific Grain Table of the Malstrom. Since this section is about creating random settings for the CV input / output there is a an easy set up that we could use the turn a straight CV output in to a random generator. This is done by using Steps that are different for each step sequencer. In this case I am choosing the settings 32 steps and 31 steps. While the track progresses over time (lets say 70 bars) it will generate a different curve at the end vs the beginning of the track. Sometimes this can be useful when a default LFO pattern just does not cut it. Or when there is a need to have sometime sound stepped in a way with a randomizer that will sound the same from start to finish (thus a non tempo synced LFO will simply not cut it in this case). Also the benefit of this set up is that we can control the amount of changes per step inside the Matrix. 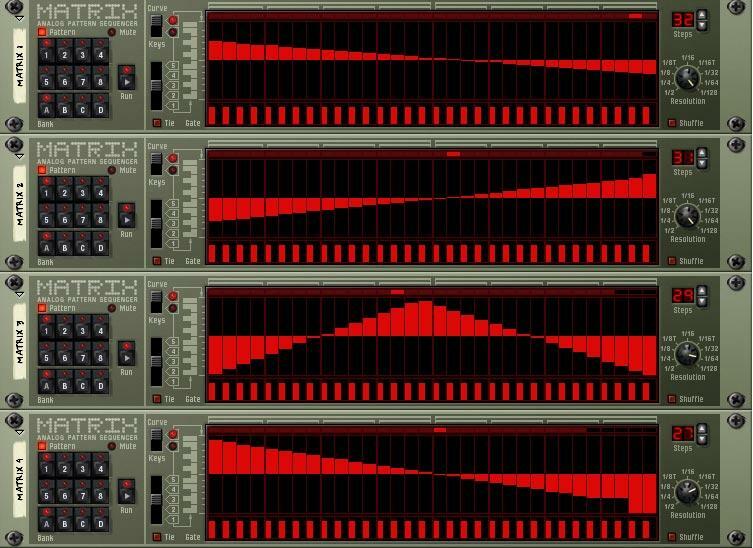 To make things sound a bit less stepped the solution would be using 4 different matrix steps sequencers where the first 2 are set on a resulotion on 1/128th notes (yeah... that will speed things up rather fast). Keep in mind to have these changes rather low (so no jumps from 63 to -64 in this case). While the next matrix is set to 1/64th, but acts more like an LFO set to triangle mode. The odd part would be having it on a step duration on 29 in this case (thus making it not equal to a bar or 8th note... that is the key). Last have a setting that does the step thing with high changes. It will get componsated by the other 3 though. But this pattern will take on the more drastic changes more or less. I think you get the idea where I am going with this I think. Last, tweak the CV amounts on the rear of the CV Merger where it is needed. If you would like to control these settings I would suggest using Thor as a CV Scaler (I am going to skip this setup for this article since I have presented this in many articles / videos by now). Last, I am going to present to you guys one more example file based on the things I have presented in this article. Main different is that this one gets gated using a Curve CV. While the thing gets gated the Modulation Wheel of the Malstrom is changed. The ModWheel will control the Shift (harmonic) and the Index (Wavetable changes) to make the sound effect go nuts more or less. 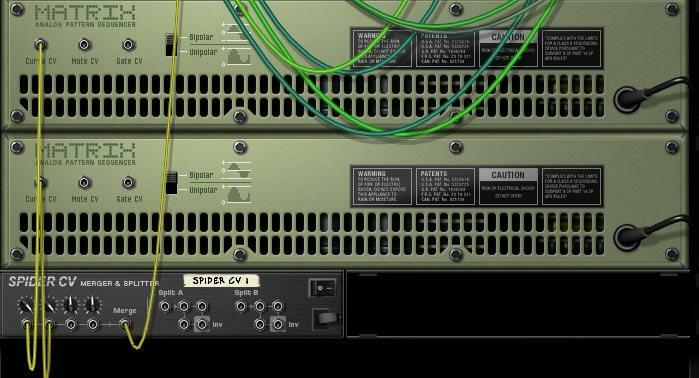 What kind of additional Matrix wiring would you recommend to our fellow readers? Let me hear it! Thanx for reading and don't forget to like us on Facebook, or subscribe.